Canada's biggest lenders have raised their prime lending rates on the same day that the country's central bank moved its benchmark interest rate 25 points higher. Canada's biggest lenders have raised their prime lending rates on the same day the country's central bank moved its benchmark interest rate a quarter percentage point higher. The Bank of Canada raised its key lending rate by a quarter point to 1.25 per cent Wednesday morning, the third time it has moved its benchmark rate from once-record lows last summer. 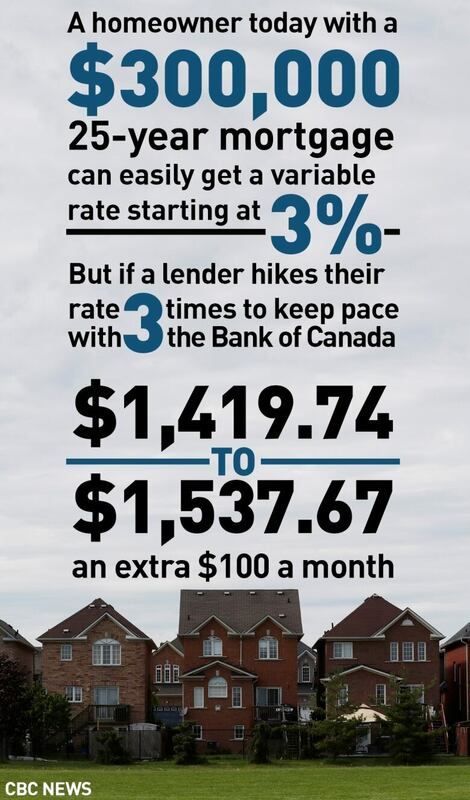 The bank rate has an impact what Canadians pay lenders for things like mortgages and personal loans. While the move means borrowers can expect to pay more, savers can expect to earn more, too, on savings accounts and guaranteed investment certificates. That's exactly what happened later on Wednesday afternoon, when Canada's five biggest banks — Royal, TD, CIBC, BMO and Scotiabank — all hiked their own prime lending rates by a quarter percentage point, effective tomorrow. As of Thursday, Jan. 18, all five now have the same prime lending rate of 3.45 per cent. Prior to the Bank of Canada's move, their rates were all 3.2 per cent. The central bank was widely expected to raise its rate after data in recent months showed gross domestic product growing, the job market healthy and the cost of living ticking higher. The bank's benchmark rate is now at its highest level since 2009. In the MPR, the bank nudged up its expectations for how the economy will perform this year and next. The bank now expects Canada's economy to expand by 2.2 per cent this year and 1.6 per cent in 2019. 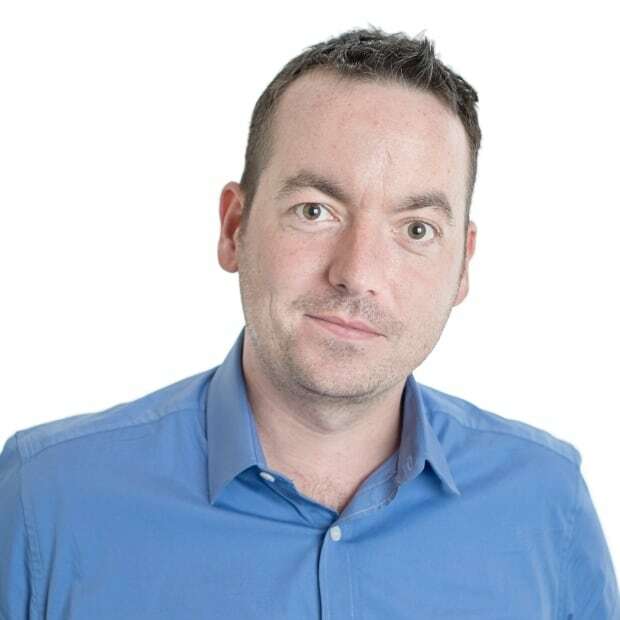 Previously the bank was anticipating 2.1 and 1.5 per cent growth. But while broadly positive about the economy's prospects, the bank cited "uncertainty about the future of NAFTA" as a reason for concern moving forward. Officials from Canada, the United States and Mexico are set to meet again to discuss trade issues next week, and there are concerns that the U.S. is getting ready to unilaterally pull out of the North American Free Trade Agreement — a development that would hit Canadian exports hard. "At this stage, it is difficult to predict the possible outcomes of trade negotiations and the timing, incidence and magnitude of their effects," the bank said in its MPR, which mentions NAFTA concerns nine times in the 21-page document. 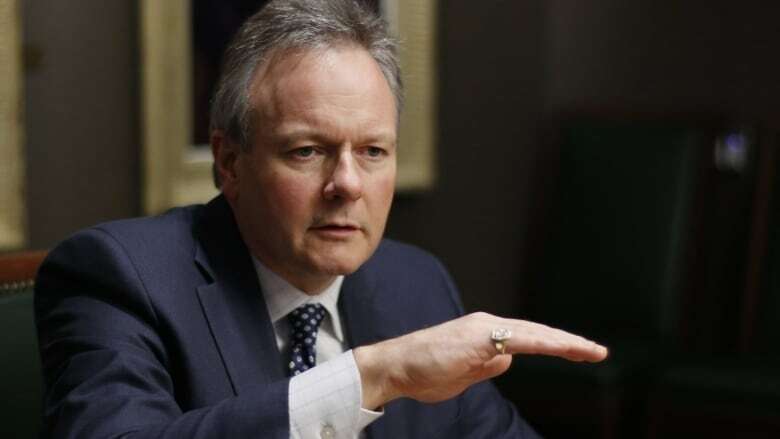 At a press conference, Bank of Canada governor Stephen Poloz expanded on that thought, telling reporters it is hard to come up with a firm number to gauge the impact of something as dramatic as implementing tariffs into a trade relationship that had previously been open. "I believe it would be net negative for both Canada and for the U.S.," he said of the theoretical demise of NAFTA, "but to actually quantify that is very difficult, because every sector is affected differently." Reaction to the rate move was muted, as the decision was very much expected. But dark clouds on the trade horizon had many watchers downgrading their expectations. "Today's rate hike was a rear-view mirror move," CIBC economist Avery Shenfeld said of the bank's decision to hike, but the concern over NAFTA "hints that the view out the front window isn't quite as sunny." At the very least, he said, the statement reinforces "the need to be cautious in how fast they hike ahead." Economist Frances Donald with Manulife agrees with that assessment, telling CBC News in an interview that while the market was expecting as many as three hikes this year, the situation is fluid. "If we continue to see those NAFTA related uncertainties," Donald said, "and if we see some downsides to the economy from new mortgage rules that came in or from potentially the increase in minimum wages then we'll probably be a Bank of Canada that needs to go more slowly." "But as long as the data continues to come in as it's been doing, steadily improving" she said, "we are going to see more rate hikes."